16 – channel sound installation for viola, cello, bells, soprano, mezzo soprano, symphony orchestra. […] Some architects consider the air between the walls of a building almost to be akin to the space inside a large instrument. After realizing this herself, Przybyła thought that music would be an optimal way to express space, and by collaborating with architects, she started to curve architectural space via sound in the forms of her sound sculpture. […] If a single gesture of composition is music, a single brushstroke circle called Ensō is also a piece of Zen calligraphic art. The cosmology of Zen appearing in Ensō is similar to Przybyła’s cosmology expressed in her sound sculpture. To understand the cosmology of Zen and its synchronicity of sound and scenery, the following haiku by Matsuo Bashō’s might be the best example. The old pond, ah! A frog jumps in: The water’s sound. […] To enjoy this Haiku, we need to imagine the sound within the entirety of the scenery surrounding it. What follows is my interpretation. While Bashō was walking, he saw an old pond. First, he simply walked by.After passing the pond, he heard the sound “plomp!” from behind him. Then, Bashō thought that the sound had come from behind him, from the direction of the old pond, so this sound must have been created by a frog, jumping into the old pond. The beauty of this poem comes from the poet’s imagination; Bashō imagined that this sound had come from the old pond, which he had seen before, so this sound must have been created by a frog, which he hadn’t yet seen. This is a simple poem made with one note, you might say, so the reader has a lot of free space to interpret. Once you can imagine the scenery, you will share the world of the poet. The image of small waves on the old pond’s surface synchronizes with the sound wave, and spreads from its center into its surroundings. So the center of the world will be the point where the frog jumped in, and the listening self located on its periphery becomes part of nature. […] In “Sound as Architecture,” Joanna Przybyła shares a cosmology with Basho and Pärt. 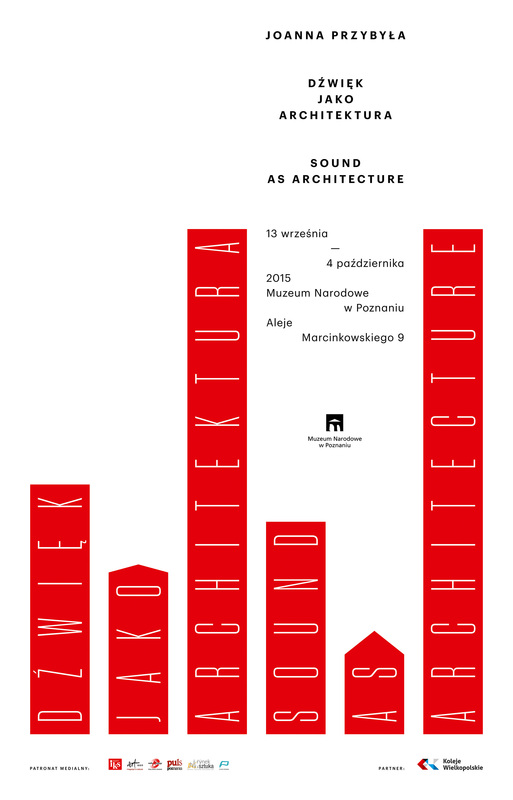 Almost like sound spreading from its birth-point to all that surrounds it, Przybyła’s sound sculpture spreads into the space and traces the form of the architecture, and even goes beyond the confines of the building. In “Sunlight Drawings for Arvo Pärt” the light gives the “form” of existence, and in “Sound as Architecture” the sound gives the “tone” of space. Language cuts the universe arbitrarily and creates the meaning inside it, but sound itself is a universe, and by the arbitrary cutting of this universe of sound, people appreciate it as music. So it is with architecture; by cutting the space and creating space inside it, architecture comes into being. In the beginning, the architect created the museum. Then, the artist Joanna Przybyła came, and said, “Let there be Sound!” The “Sound as Architecture” in architecture.